A local favorite playing on Saturday – June 24 @6pm! What do a financial planner and worship leader, a circuit court judge, doctors of accounting and physics, and members of Samaritan’s Purse staff all have in common? Well they all love to play music together as the band Amantha Mill. The TCPO is excited to have Amantha Mill playing in Todd again this year as part of our free concert series. They will be Saturday, June 24, from 6-8:00 pm in Cook Park in downtown Todd. The band members all call the greater Boone area their home. Amantha Mill got its name from the small community of Amantha outside of Boone. There used to be a mill there until it was washed away in the flood of 1940 but the memory of the mill lives on through the band. They have been playing together since 2001 and they like to play a wide variety of acoustic genres including contemporary bluegrass, classic country, western swing and maybe a little beach music or rock and roll. You’ll hear a mixture of original songs and some well-known favorites. 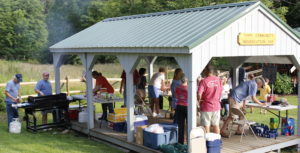 Amantha Mill likes playing in Todd due to its beautiful setting and familiar feel with many family and friends. They say it is like coming to a family reunion. The band members like to have a good time with the audience and each other. We hope you can step away from your busy lives with them, relax, enjoy the music and have a good time. Contact us if you are local and interested in helping with our blog, Slice of Todd Life. Nobody knows Todd better than its residents and there are many opportunities to get involved.